Over the years I have had the pleasure to have a few of my photography students in front of my lens for Mystic Bliss Empowerment Cards. This young lady is one. I love the way I was able to surprise her the day she met with me to get into costume and head to the countryside to where I had arranged to do the session. MacKenzie is quite known in her circle for her love of horses yet did not have easy access to them at the time of this session. 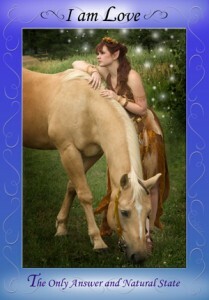 I could not have imagined the I am Love card featuring this amazing young lady without at least 1 horse in it. It took a bit of doing but thanks to a couple of friends who helped me, I was able to set it up. Over the moon, would be an understatement regarding her reaction if I were to guess by the squeal of delight I heard as she realized we were pulling into a farm that afternoon and she easily put two and two together. Knowing that this was making her shoot even more special to this gentle soul pleased me. I am sure that I could claim many cards in my deck as a favorite for one reason or another but my heart still warms at remembering how easily MacKenzie connected with her session partner that day and the instant friends they became. The resulting image is proof of the love shared in that session. 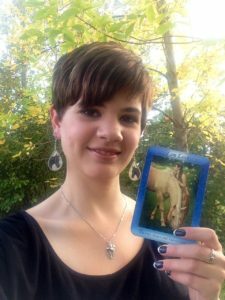 She sent this image to me a little while ago, several years later, and I think it is safe to state that she still enjoys the memory of this session and the part she gets to play in the energy of the Mystic Bliss deck in the series.